The Jamie Galloway Crawfish Boil and Block Party, known as the “most anticipated event before festival season,” takes place Sunday, March 31, in the 8300 block of Oak Street. 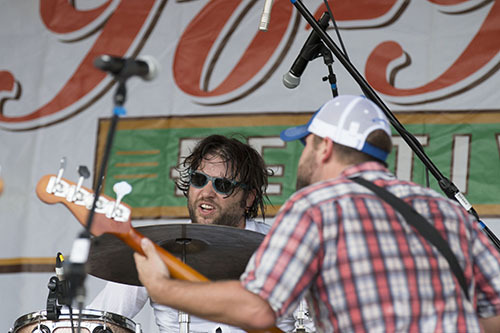 The seventh annual boil and block party, a benefit for the New Orleans Musicians’ Clinic & Assistance Foundation, features live music on two stages . The world’s largest crawfish table contains a feast from master crawfish boilers Jason Seither (voted best boiled seafood, Louisiana Magazine) and James Clesi (voted best catfish in New Orleans). This community-driven event also showcases more than 50 New Orleans musicians in one big afternoon. Featured musicians on the outside stage include George Porter Jr. & Runnin Pardners, Papa Mali, 101 Runners and SOUL Brass Band. Johnny Sketch & The Dirty Notes w/ Camille Baudoin, Dave Jordan & The NIA, Mikey B3 Band, Billy Iuso & Restless Natives, Soul Project are playing on the inside stage. James ‘Jamie’ Galloway III, a beloved Oak Street musician and chef, was 41 when he passed away in 2012. A fiber in the fabric of the local music scene for over two decades, Gallowway played alongside Dave Jordan, the festival music director, in the band Juice, providing harmonica, percussion and vocals. In addition to spreading his love of music, Jamie made sure everyone around him was well fed, Jordan said. Advance tickets are recommended to save money and to ensure availability. They can be purchased online at neworleansmusiciansclinic.org or eventbrite.com and in person at Clesi’s Restaurant & Catering, 4323 Bienville St.; Seither’s Seafood, 279 Hickory Ave. in Harahan; Maple Leaf Bar, 8316 Oak St. (from the daytime bartender, 3-9 p.m.); and Dirty Coast, 5631 Magazine St.
General admission tickets include unlimited crawfish and access to both stages. They are $30 in advance and $50 at the event. VIP passes includes a private crawfish table, beer and other perks. They are $100 in advance and $120 on the day of the event. The New Orleans Musicians’ Assistance Foundation evolved from the New Orleans Musicians’ Clinic following Hurricane Katrina in 2005. The clinic provides cost-efficient access to direct health care, mental health support and social services for more than 2,500 performing artists. The foundation promotes wellness and preventive health education, musician advocacy and support in the broader New Orleans music community.